The world really is a huge place and there is so much to see out there. In today’s economy if you have the mean to travel the world, but you are taking advantage of the opportunity, you are really missing out. Most people don’t have the chance to travel as often as they would like. Most people already know this, but still they let their fears consume them and prevent them from traveling. Maybe you have just heard horror story after horror story or maybe you experienced a bad situation. Whatever the situation is, you really shouldn’t let these fears stop you from traveling and seeing the world. 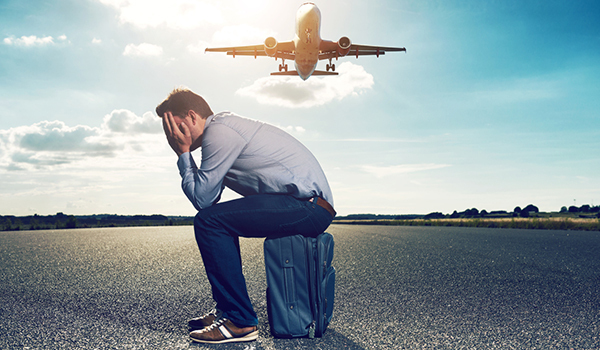 So, what are the biggest fears that people experience when traveling? Male passenger sits on his suitcase on an airfield runway and covers his head in his hands. He looks tired and frustrated. Perhaps his plane got cancelled or delayed. Perhaps he missed his plane. Sun shines in the background where an airplane takes off. Most people are constantly afraid that they are going to lose something important to them. Sure, there are some things that aren’t replaceable, but money, passports, computers, and cameras can easily be replaced. Even if you don’t get pickpocketed or robbed there is always a chance that you could run off and leave a bag in the hotel room or on the subway. Of course, someone else would probably claim it. Well, you can mostly avoid these situations by getting a handy little backpack or fanny pack. Store your accessories inside and keep the bag clipped to your person at all times. This will greatly minimize the chances of you losing something. Sure, it is perfectly natural to fear for your safety when traveling to unexpected locations. In fact, it is actually smart to be a little scared and know that bag things can happen anywhere. Whether you are investing in a Hong Kong Tour Packages trip or you are planning your own, you should not let this stop you. With the advances in technology and crime statistics, you can literally do all the research that you need to online. Find out what areas are safe and during what times of the time. Using this research combined with a little common sense and you will be able to keep yourself safe at all times. Most people avoid traveling because they either have elderly parents or friends that just can’t make the trip with them. In these situations, most individuals will experience immense guilt about leaving their loved ones behind. The truth of the matter is, that the individuals that love you should not give you grief or make you feel guilt about wanting to achieve and explore your dreams. In fact, they should support you. With all the technology in today’s world, you can easily and quickly keep in touch with your friends and family from all around the globe. Depending on where you are traveling there is a good chance that you could be exposed to a variety of negative health conditions. Getting sick in an unfamiliar location will not only ruin your trip, but it can be scary. You have to get the proper vaccinations and be careful about what you eat. Once again, research and planning ahead will be your best friend for avoiding this situation.